Die Antwoord, The Constructus Corporation, Jack Parow, Jaak and MAXNORMAL.TV. &apos;N spesiale-Afrikaanse mengsel op hierdie Sondag! 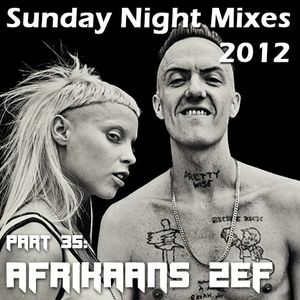 ZEF is a South African counter-culture movement and the form the inspiration for the African hip-hop group Die Antwoord and their colleagues like Jack Parow and Jaak Paarl. Die Antwoord is created by Watkin Tudor Jones (Ninja) and Anri Du Toit, much better known as Yo-Landi Vi$$er. Before Die antwoord they tried several different concepts, Max Normaal and The Constructus Corporation. Not only did they do the music for these projects, they also created video&apos;s, clothing and toys as part of the whole concept. The music can only be described as rude (especially when you understand Afrikaans) and yet extremely catchy. The signature video&apos;s make it almost impossible not to be noticed. In 2009 Die Antwoord&apos;s first video clip went viral on Youtube (http://tinyurl.com/FirstViral), starting their success. I&apos;ve added several links to their video&apos;s. Watch them, its part of the experience! For me this &apos;Sunday Night&apos; happened now .... a little late but entered very well! Een zeer knap staaltje werk, ik heb er even naar geluisterd. That was the maddest thing I&apos;ve heard in ages! Whoa!! This is hella coo&apos; feel&apos;n dis MIX! south-africa keeping the hiphop spirit alive! love it! + good mix!